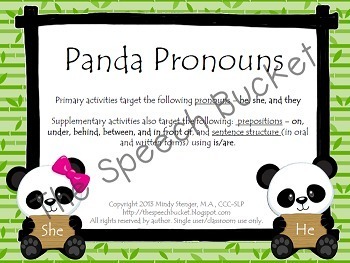 This super cute Panda Packet was created by Mindy Stenger, M.A., CCC-SLP (The Speech Bucket). It includes early language activities which target the following concepts: pronouns (he, she, and they), prepositions (on, under, behind, between, and in front of), and sentence structure (in oral and written forms using is/are). 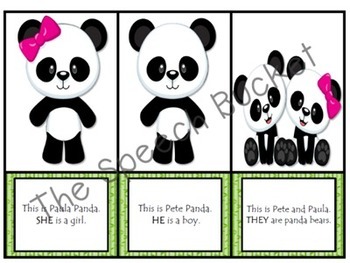 Pages 2 – 6 target identifying correct pronouns by sorting the pandas (e.g., “She is a girl”; “He is a boy”; "They are Pandas"). There are two sorting boards and 18 picture cards (6 - girl, 6 - boy, 6 - pandas). Pages 7 – 11 target identifying the correct pronouns by filling in the blanks on each card. This set also targets prepositions within the sentences and pictures. Pages 12 – 15 target written language. These pages are writing prompts, which ask the student to fill in the correct pronoun and continue the story with their own sentence. Check out the preview for more pictures.